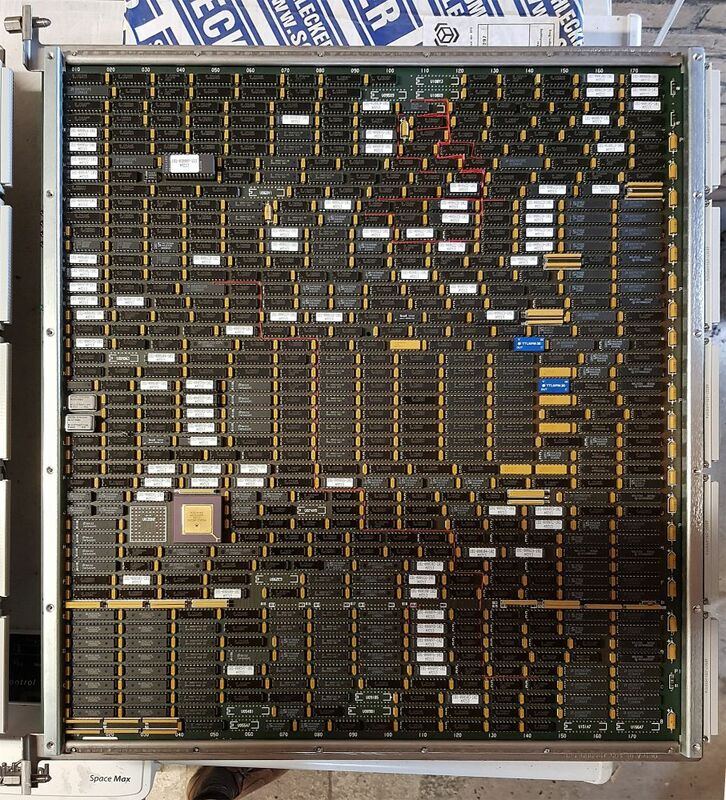 About a week ago, the Convex C220 arrived, this is the first part of the Convex C2 Shipment (the Convex C240 will follow three weeks from now). 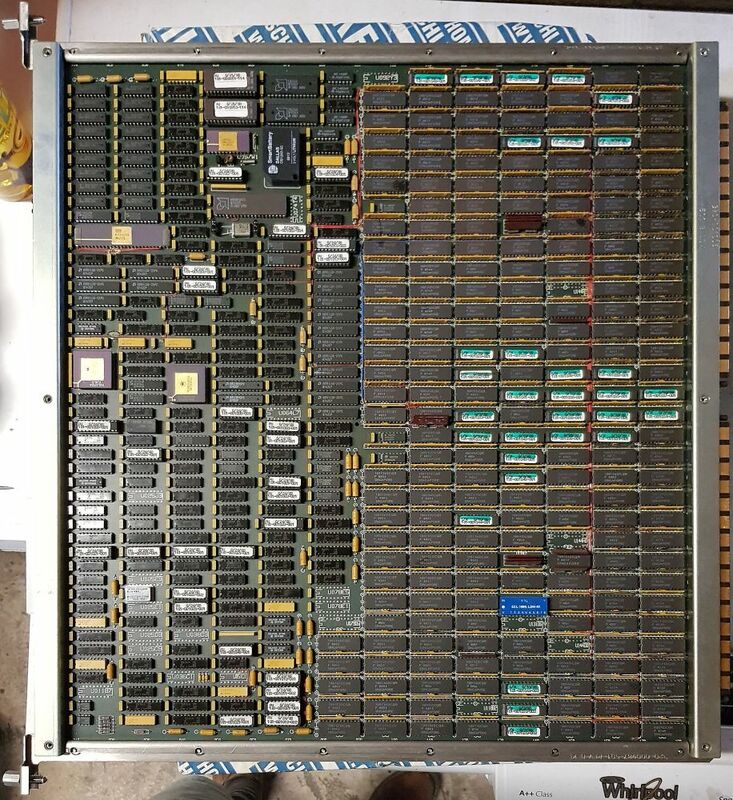 This first shipment consisted of the C220 CPU cabinet, a couple of empty I/O cabinets, some spare parts, some software tapes, and a lot of documentation. 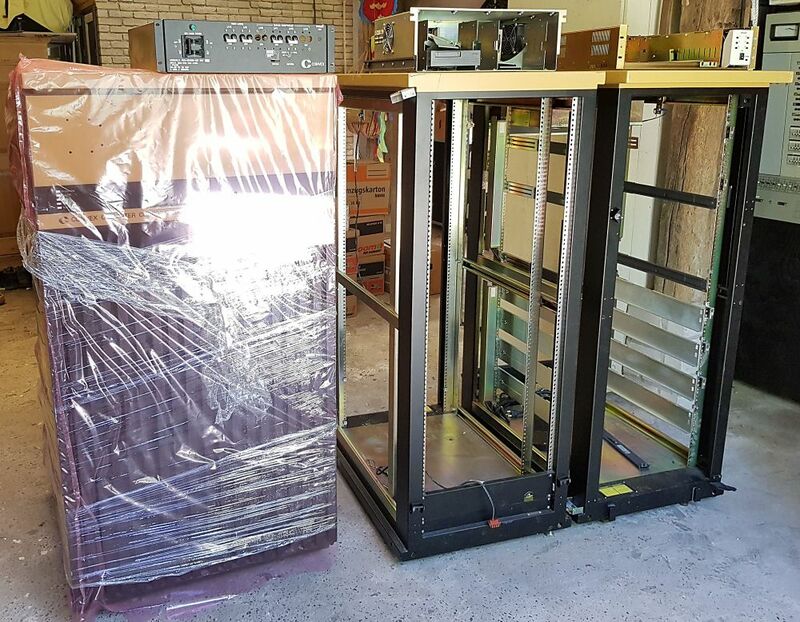 The second shipment will consist of the C240 CPU cabinet, more I/O cabinets, I/O devices, more spares, tapes and documentation. 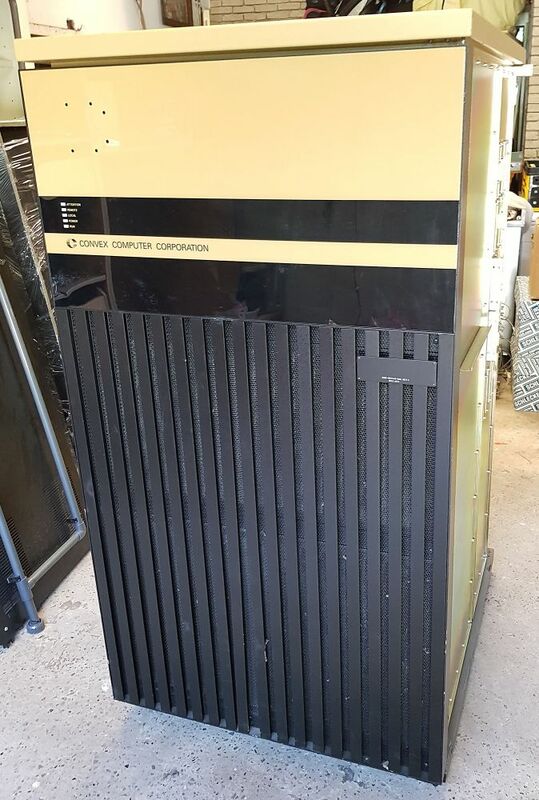 As you can see, getting the C220 CPU cabinet inside involved getting a helping hand from a local farmer, which was a first for the collection. 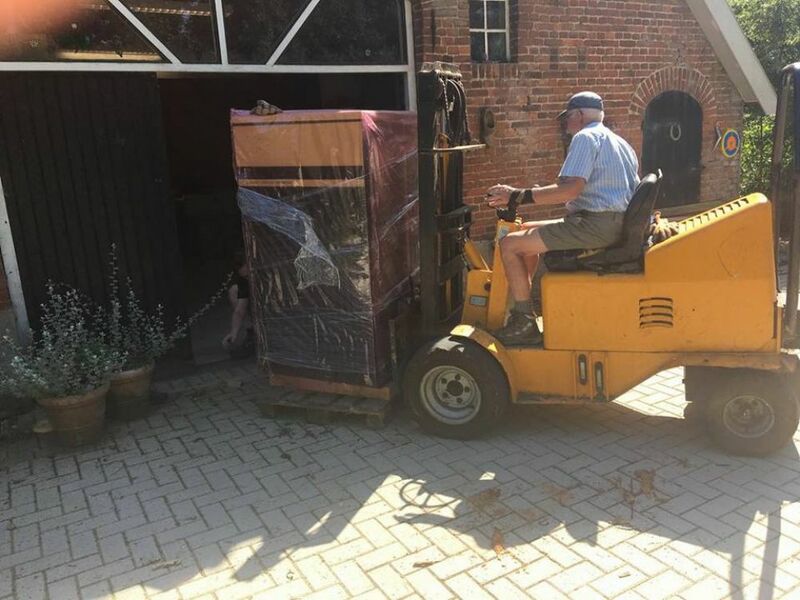 The CPU itself is on wheels, but it was placed on a pallet. 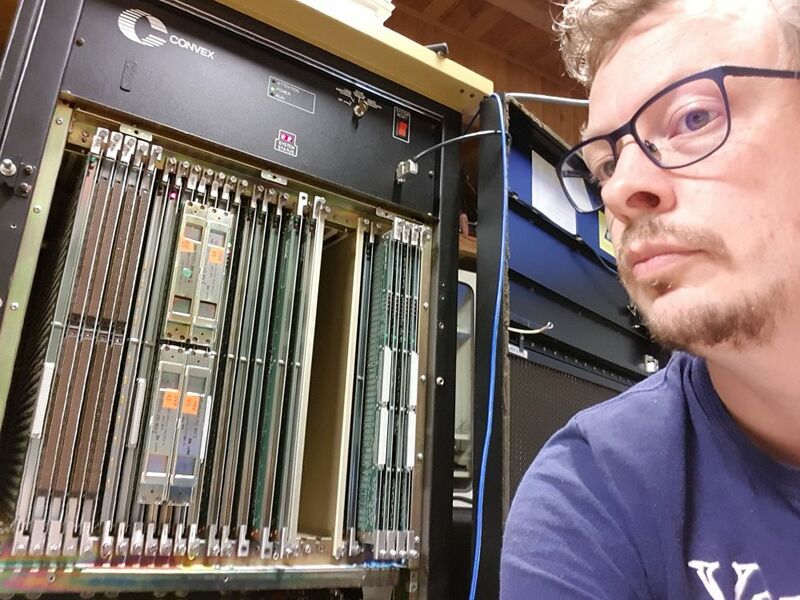 At first, I borrowed a manually operated pallet truck to move the CPU out of the van, but unfortunately the pallet truck was somewhat broken, and would not lift the CPU high enough to get over the threshold. 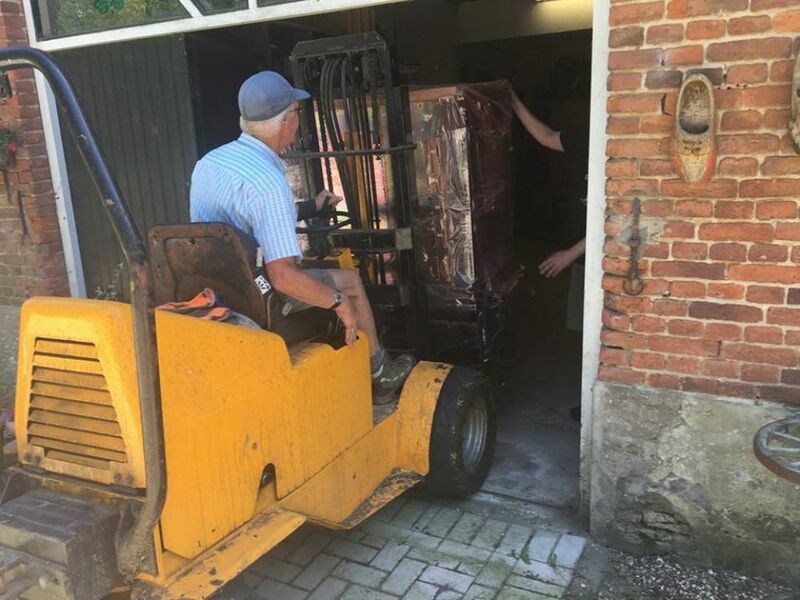 After a phone call to Edwin, a farmer in our village we're friends with, he sent his father with a diesel pallet truck, which we used to lift the CPU from its pallet, and put it inside. Of course, what really gets the attention is the 1600 amperes delivered into minus 4.5 volts, and the 800 amperes delivered into minus 2 volts. 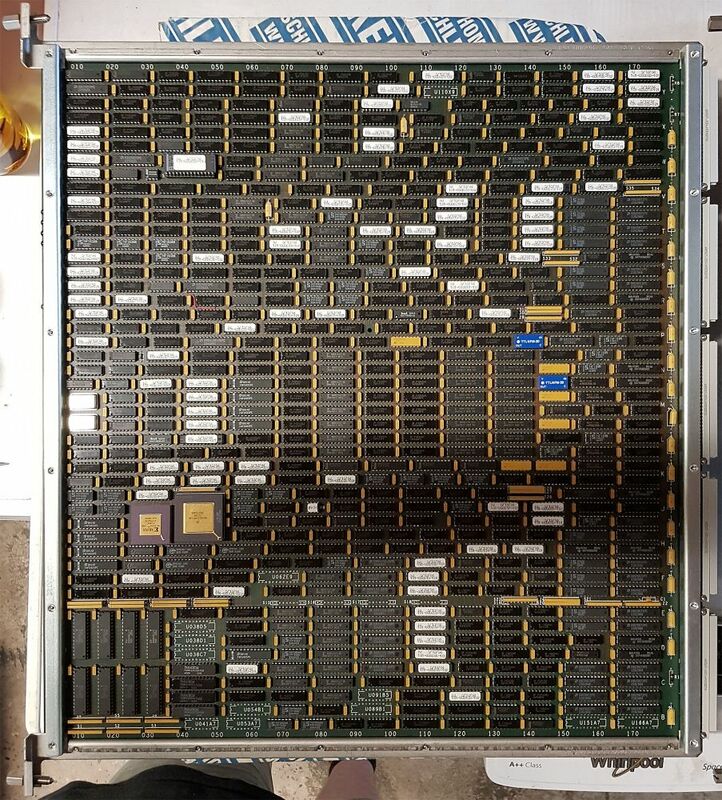 Those familiar with exotic processor technology may correctly guess from this that this is an ECL machine. ECL (Emitter Coupled Logic) uses negative signal levels. Rather than use the transistors as on/off switches, the transistors in ECL logic are always conducting energy. By avoiding the cutoff and saturation regions of the transistors behavior, higher switching speeds can be achieved. This comes at the expense of power consumption and component density. The -4.5 volts is the power supply for the ECL logic. In addition to that, every ECL output signal needs termination. Traditionally, this was done through a resistor network, one resistor to the negative power supply, and one resistor to ground. In this machine, however, a second power rail (-2 V) is used for termination through a single resistor, which reduces the power draw a little bit. 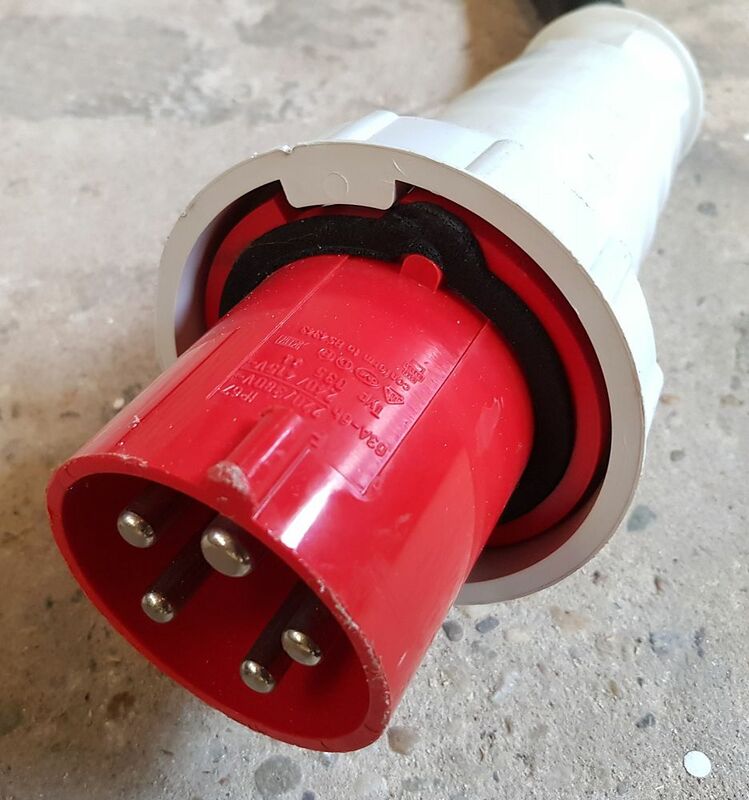 The power cable for this system is fitted with a 63 ampere 3 phase plug; I needed to use two adapters to hook it up to a 16 ampere 3-phase circuit. 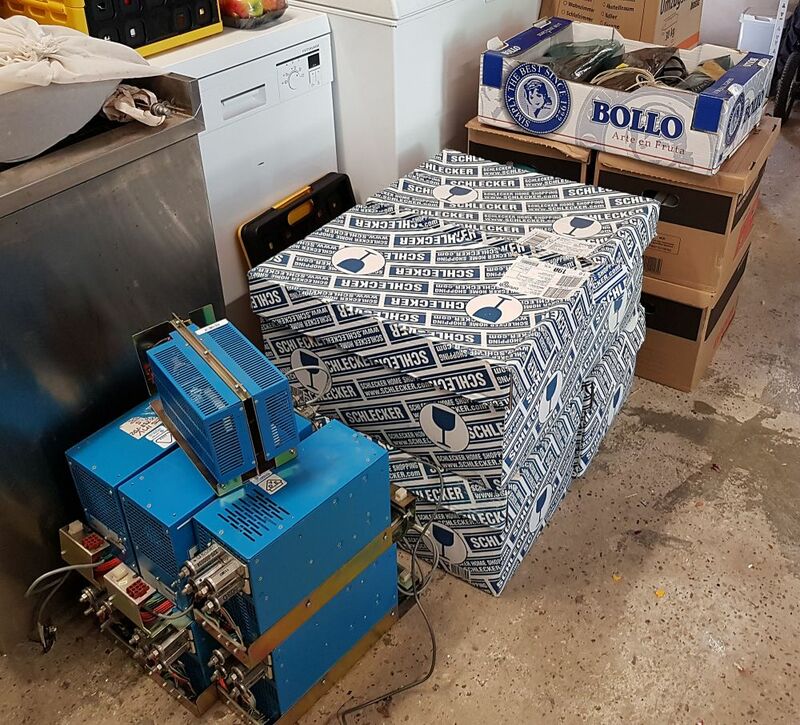 Also visible in one of the photos are spare power supplies, and boxes of spare parts, installation tapes, and documentation. So far, I have scanned some of the documentation (in total, there are some 300 publications in there), and made it available in the Convex Documentation article. 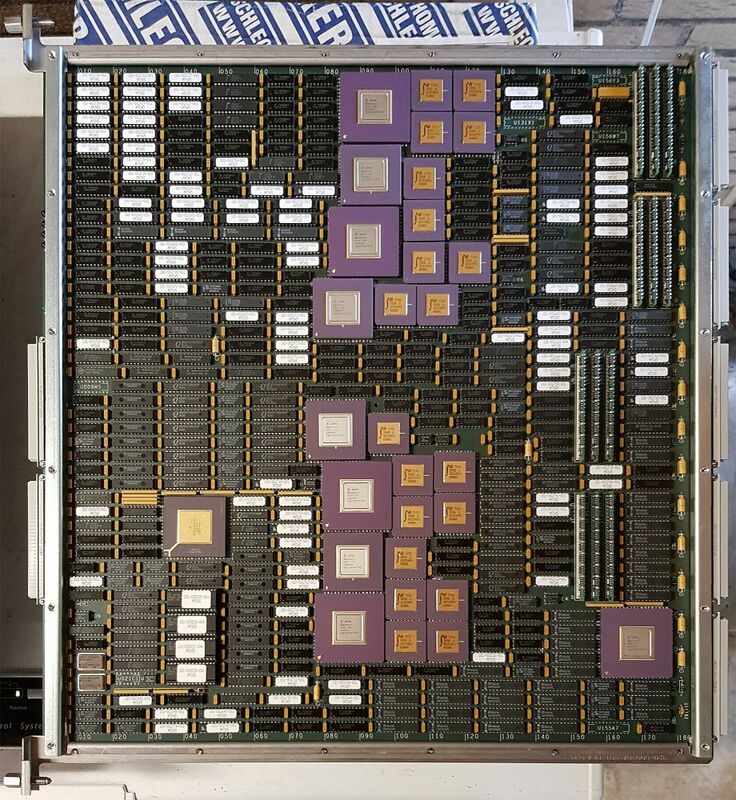 On the left side are the two CPU's, each consisting of 6 cards. Vector instructions are executed on the VPD and VPC cards, memory accesses for these instructions bypass the cache. Scalar instructions are executed by the SFU, accessing memory through the data cache on the DCU. Instructions are dispatched by the IPP, which determines whether the instruction needs to be executed by the vector processor or the scalar processor, takes care of the instruction pointer, and handles conditional execution (so the actual processor only sees those instructions that need to be executed). Finally, all memory accesses, for both scalar and vector data, and for instruction fetches, go through the ASP to get to the main memory. The DCU and SFU, and the IPP and ASP are connected on the front of the machine as well, using two of the 300-pin connectors jumpered together, and mounted on a sturdy metal bracket for strain relief. 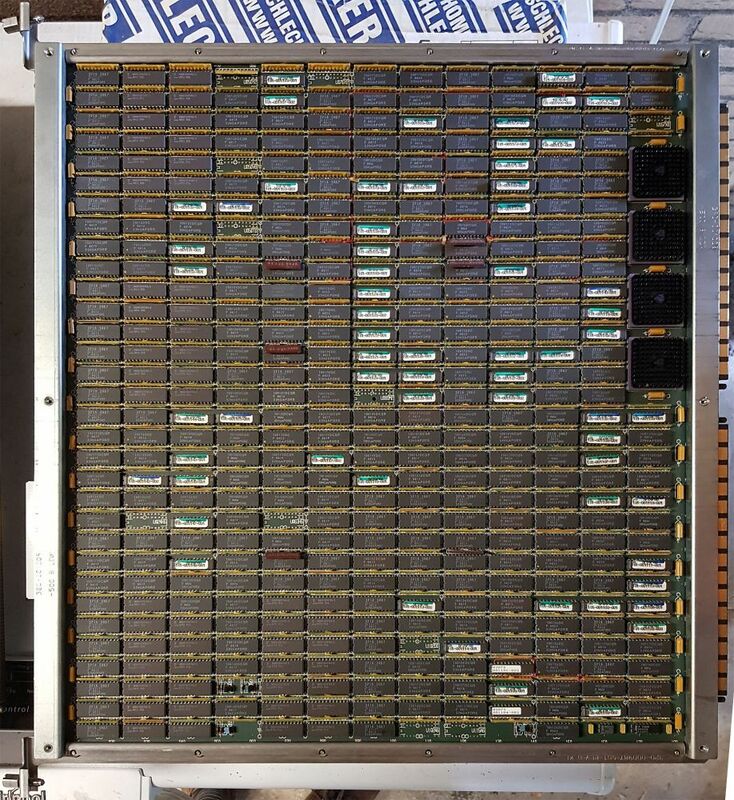 The SP2 is a computer in itself, based around a Motorola 68000 CPU. It is used for diagnostics and booting, and during operation, the SP2 monitors the operation of the entire machine. The SP2 is connected to the SCM (System Control Module), mounted below the card-cage. 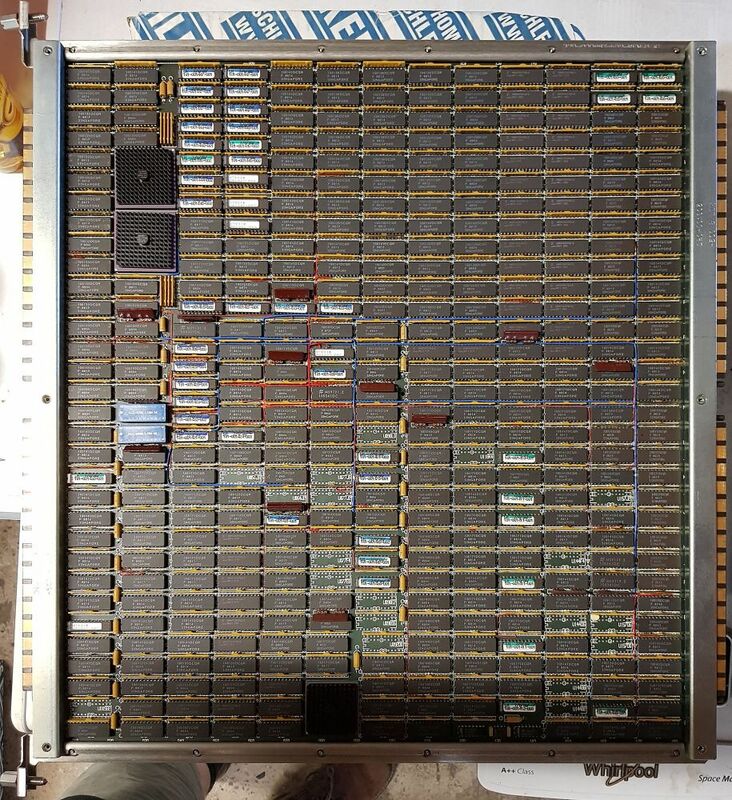 The SCM is a very simple computer, built around a 6805 micro controller. It is powered on as soon as power is supplied to the system and the main breaker is on, through a small linear power supply. 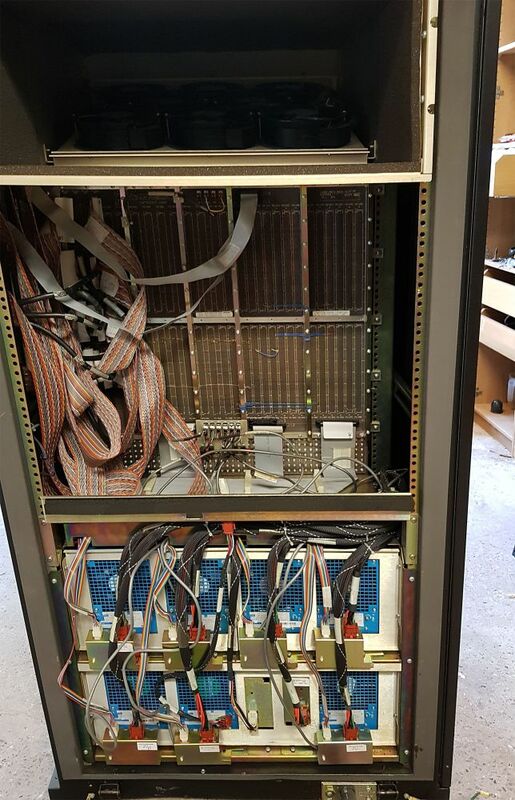 The SCM monitors the environment, power supplies and fans, preventing power from being delivered to the main cardcage if operation is unsafe, and shutting the system down quickly when there's a problem. 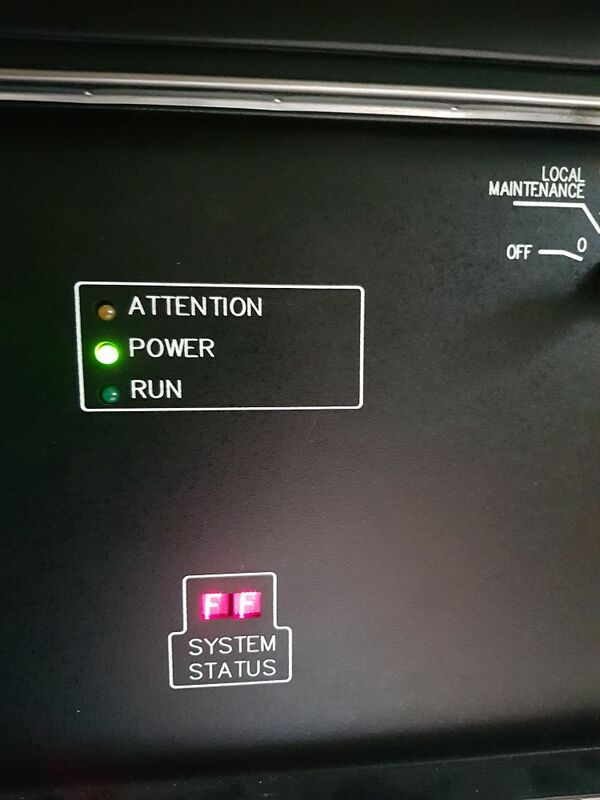 At power-on time, the SCM also checks to see whether the correct cards are installed; if the wrong type of card is installed in any slot, the SCM will prevent powering on the machine. The SCM's status can be seen on a small 2-digit hexadecimal display on the front of the machine. FF indicates no problem, other codes indicate a problem or warning. These codes are listed on the inside of the front door. 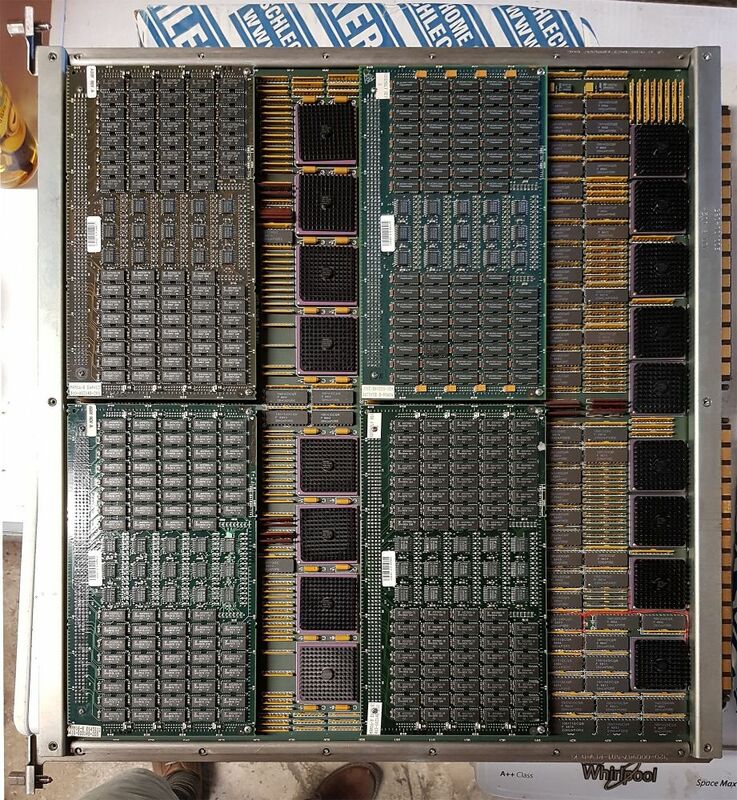 To the right of the CPX is the memory (MCM boards - Memory Control Module). 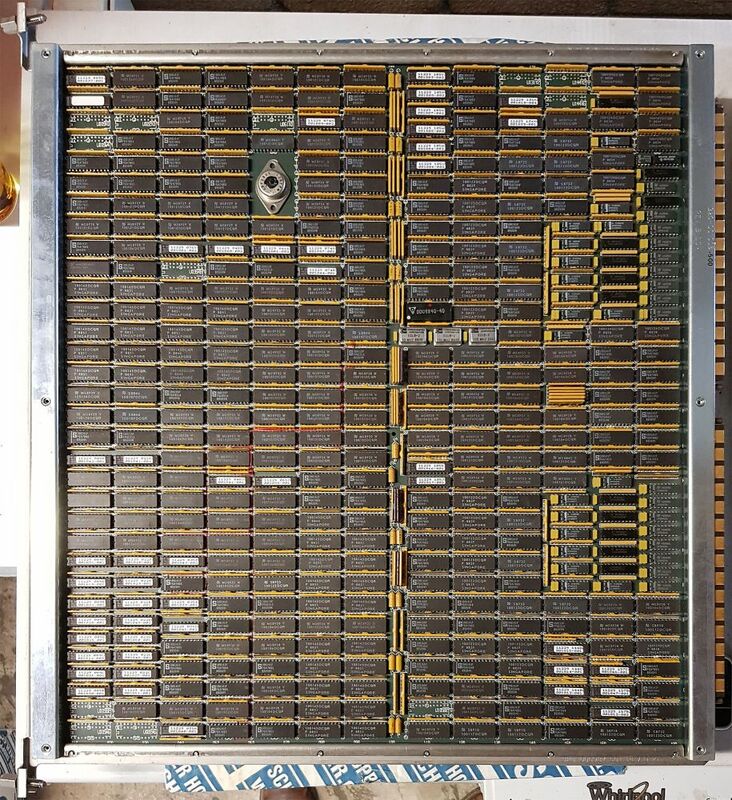 This C220 has 4 boards of 64 MB each installed. 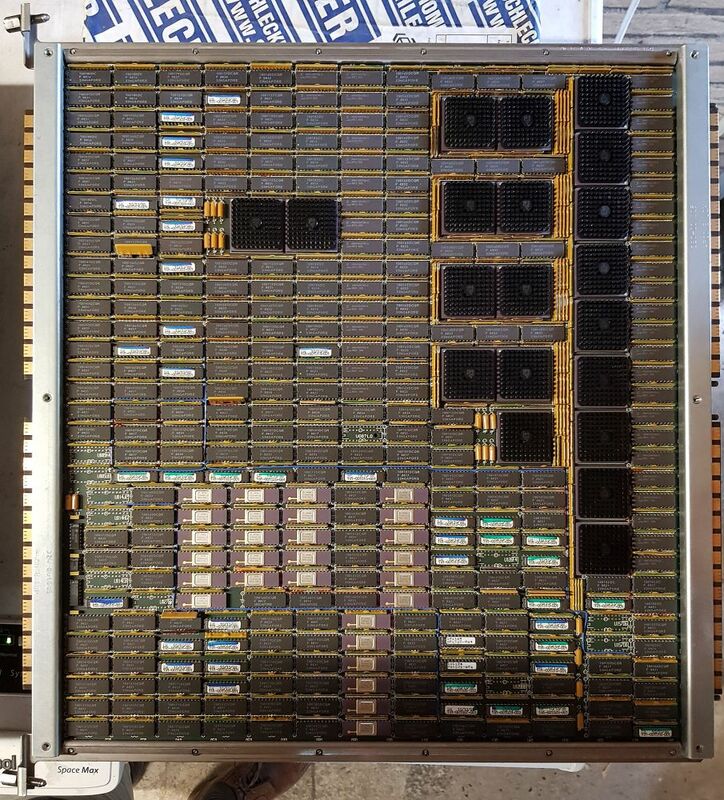 A maximum of 8 boards can be installed, and I believe there are larger memory boards. 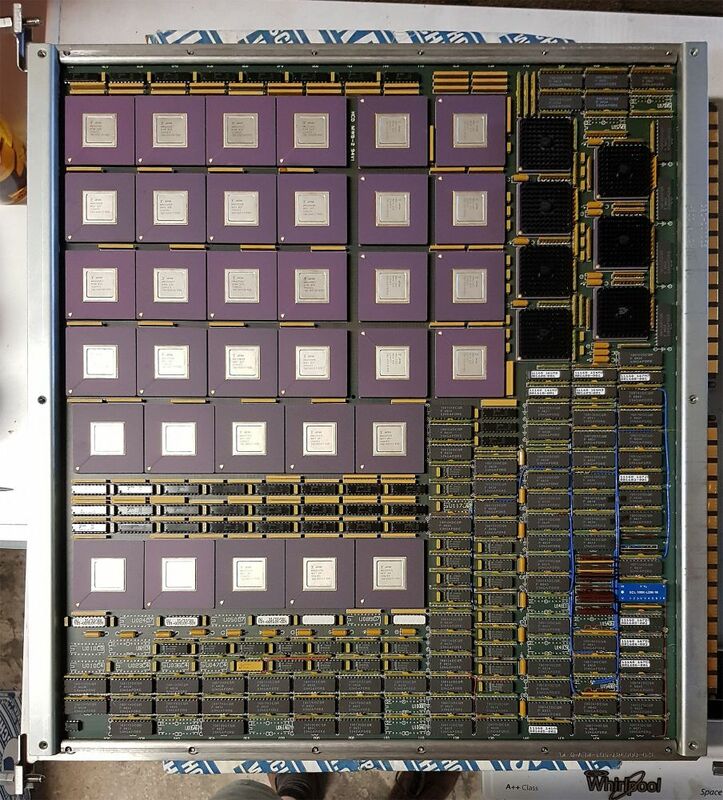 The MCM contains 4 plug-in modules with the actual memory, and gate arrays to perform ECC generation and checking (7 ECC bits for every 32 data bits), as well as a 5 port crossbar so CPUs and I/O can efficiently share memory access (without the bottleneck of a bus). MCMs need to be installed in pairs (odd and even addresses). 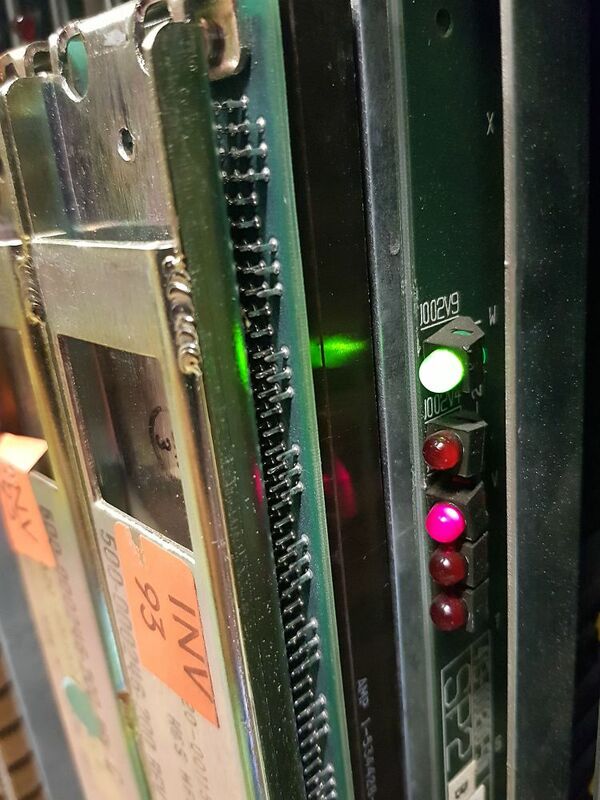 The PIA is connected to one of the ports on the MCMs, and provides a PBUS, which is the same bus as the main bus that was used in the C1. Because of this, the C220 can use the same I/O controllers as the C1. 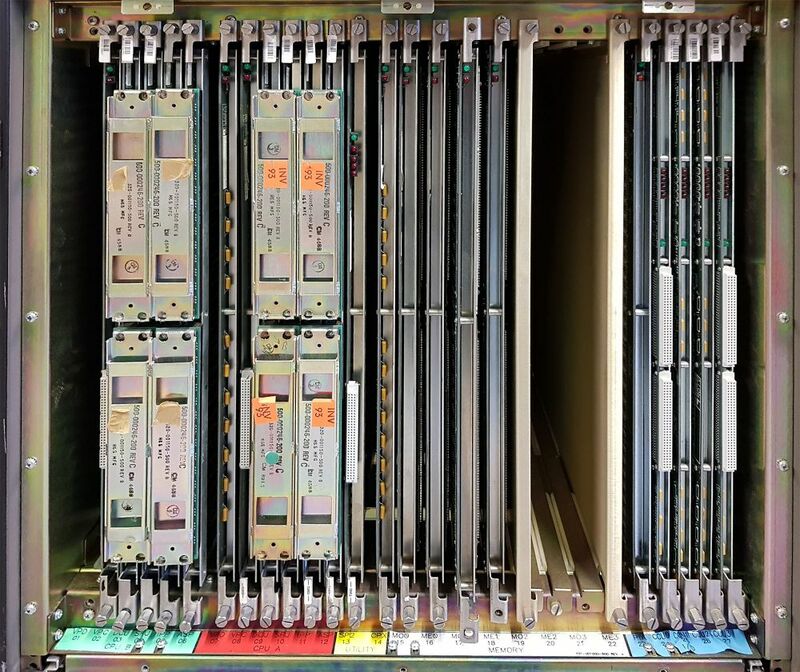 The IDC (of which there are two in this system) is a direct attachment adapter for disks (rather than going through either a Multibus or VMEbus card cage). It provides 4 disk channels, each of which supports up to 8 IPI disks. 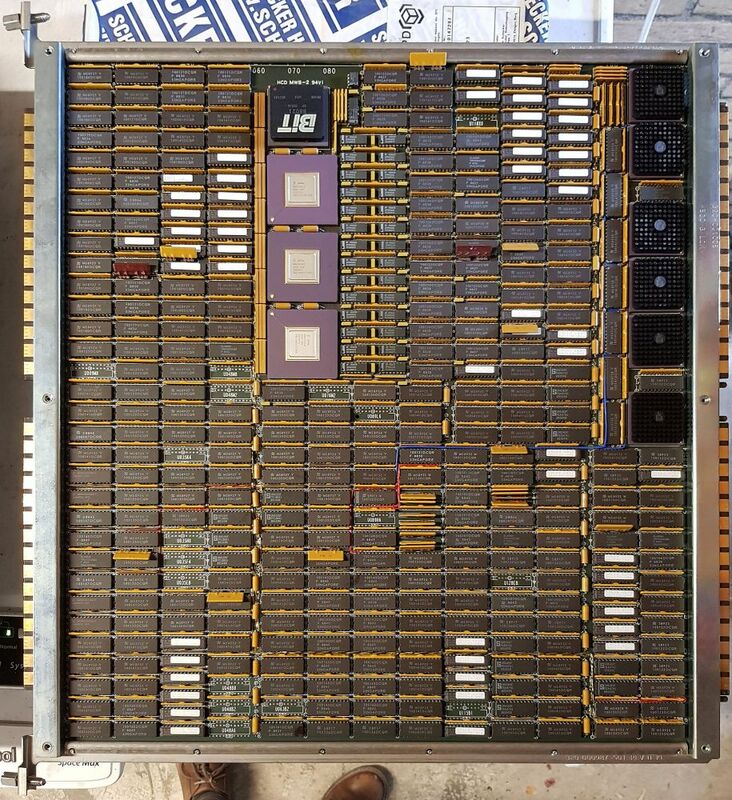 the IDC runs its own operating system on a Motorola 88000 RISC processor. 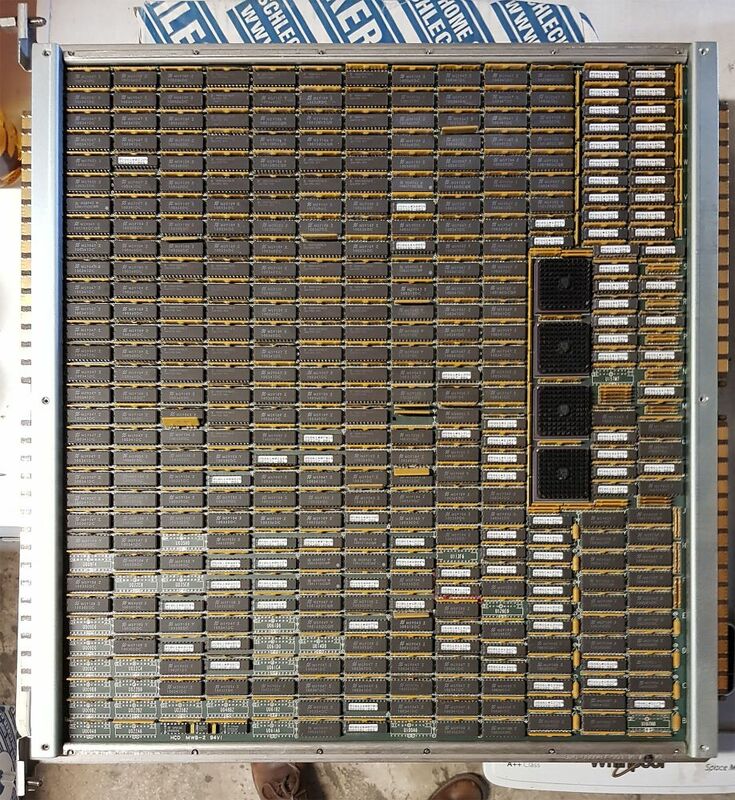 The RTIOP and VIOP each support a VMEbus chassis. 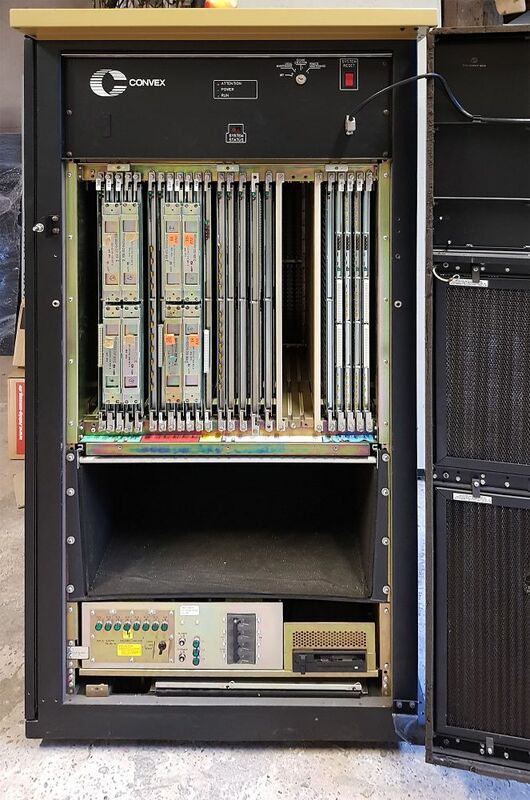 The VMEbus chassis in turn supports disk and tape controllers, network interfaces, terminal interfaces, etc. 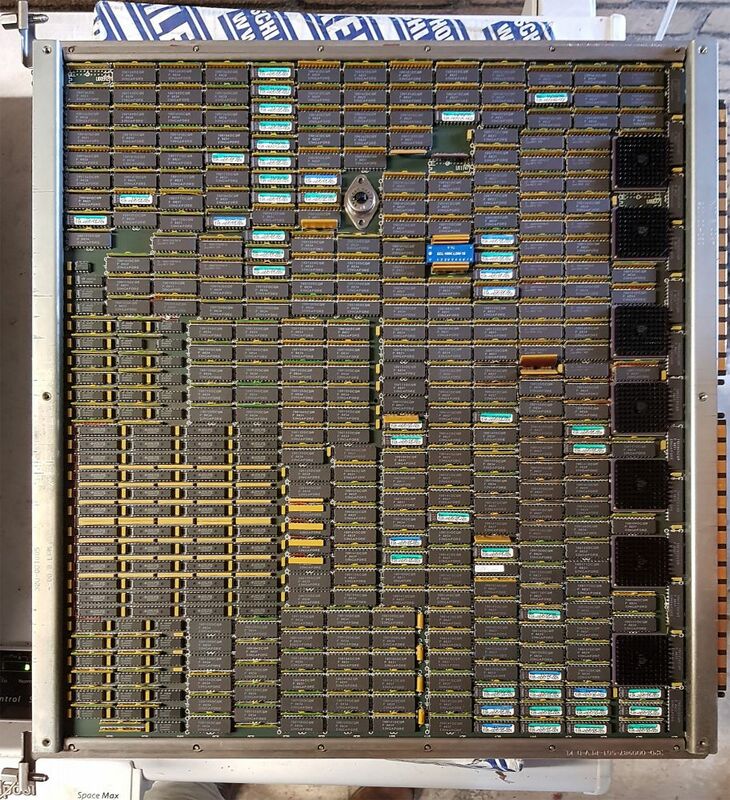 The RTIOP and VIOP use a Motorola 68020 CPU.